At 86 ppm (Letter), the Canon imageRUNNER 7086 device offers the speed and versatility to serve as a complete document publishing and communications hub device for busy corporate departments. 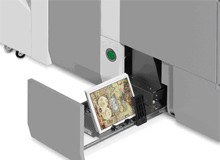 The system can tackle the diverse range of document production tasks common to walk-up and networked environments including booklet finishing, professional hole-punching, paper folding, and more. By including Canon’s Universal Send technology you can also leverage the system as a high-speed scanning and document distribution solution for print-on-demand needs. Best of all, the imageRUNNER 7086 model is Internet-ready and offers customization capabilities through Canon’s MEAP technology, so you can be assured of the tightest possible integration and device control across your entire corporate network. Delivers output at 86 pages-per-minute (LTR) to meet the rigors of high-volume offices and production environments and is equipped with a 40GB Hard Disk Drive and 1GB RAM, providing users with exceptional productivity and reliability. Incorporating Canon's MEAP (Multifunctional Embedded Application Platform) architecture, the imageRUNNER 7086 can be customized to meet unique business needs. Customized applications can run from the device's control panel, streamlining document workflows. The imageRUNNER 7086 device's extensive finishing capabilities are designed to handle the most common high-volume printing applications, such as booklets, training manuals, etc. 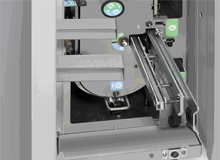 Two optional finishers are available, all of which deliver single and multi-position stapling. Support for saddle-stitching, Z-folding, booklet trimming, 2- or 3-hole punching and post-process document insertion is also available. Available support for actual 1200 x 1200 dpi* print resolution and Canon's exclusive Fine Character and Edge Technology (FCET) for outstanding image quality on every page. * Available when printing with Canon UFR II, PCL 6 and Postscript 3 Page description language. The Mail Box functions of the imageRUNNER 7086 serve as a centralized system for information-sharing, on-site document storage and print-on-demand applications. 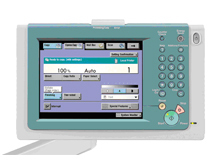 With its Universal Send technology, the imageRUNNER 7086 allows users to scan directly into the device for distribution to multiple destinations. The Universal Send PDF Security Feature Set (optional) provides advanced options to help prevent impersonation, unauthorized alteration, or interception of your documents. With Digital Device Signature mode, recipients can be assured of the originating device of documents. You can also protect the content of your documents with the Encrypted PDF feature, and secure them with a password to restrict access, editing, and printing. The Digital User Signature option enables verification of your identity to recipients by adding your digital certificate to your documents. With Remote UI, features and functions of the imageRUNNER 7086, user's can monitor and control the device from anywhere on the network. Paper Sizes Paper Deck-W1: Letter Paper Deck-X1: Letter-R, Letter, Legal, 11" x 17"
Paper Sizes 11" x 17"
* The Professional Puncher-A1 cannot be installed simultaneously with the Perfect Binder-A1. 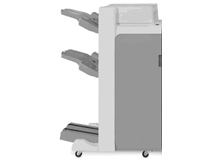 The Professional Puncher-A1 and the Puncher Unit-V1 can be installed simultaneously. 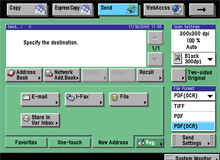 ** 1200 x 1200 dpi resolution for PCL printing is not supported on Windows 9x/Me Clients. Note: Some accessories require additional equipment or may be prerequisites for other options. Check with your Canon Authorized Dealer for details.